Deliver your track at the right level. This meter is making sure that your track is being delivered at the right level. Step 1 : Upload your track. We do not keep your track! We will delete it right after the analysis. Your data is safe. Step 2 : Choose a target. We are providing several standard targets such as Spotify, Youtube, Apple Music and more. Your LUFS-I level is optimized in order to avoid further online processing once uploaded. The goal is to make sure your LUFS-I level is aligned with the LUFS-I Target. 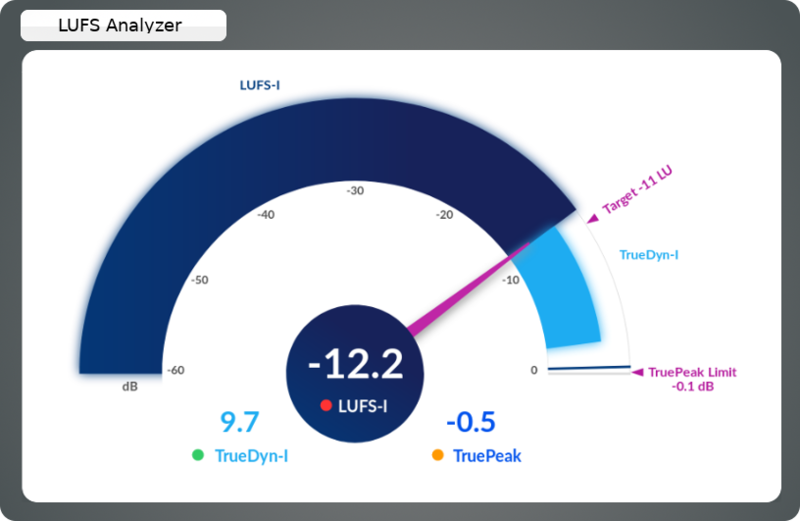 Your TRUEPEAK Max (this is the highest peak of your track) does not exceed the Target TRUEPEAK limit. Make sure your TRUEDYN-I is as high as it can be. The TRUEDYN-I is pureMix' way to measure your music's dynamic. In a nutshell, the higher the TRUEDYN, the better your music breathes, the more dynamics there is. Step 4 : If you get 3 green lights, you are good to go!